Description: Learn additional string variations and easy resources for inspiration; the step by step break down of additional tangles; and the introduction of embellishments to add to your images. Materials: No materials fee if you bring the mini-kit from the introductory class. The tiles for this workshop will be provided. If necessary, additional supplies are available for purchase. 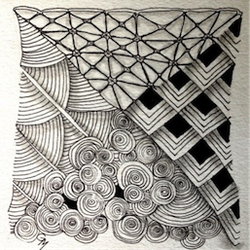 ﻿Notes:﻿ Prerequisite – Introduction to Zentangle® Drawing Workshop. Minimum enrollment required for this workshop to proceed. Limited seating!